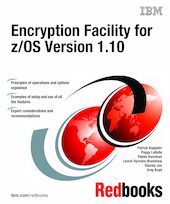 This IBM Redbooks publication introduces IBM Encryption Facility for z/OS, Program Product 5655-P97, from the description of its principles of operation to information related to its setup intended for system programmers and security officers. We include recommendations, based on our own experience, in the chapters addressing these topics, including warnings and explanations about problems we discovered during our own trials. This book also addresses in detail the many options proposed by the product and provides you with considerations and recommendations regarding proper selection of these options in the planned context of use.